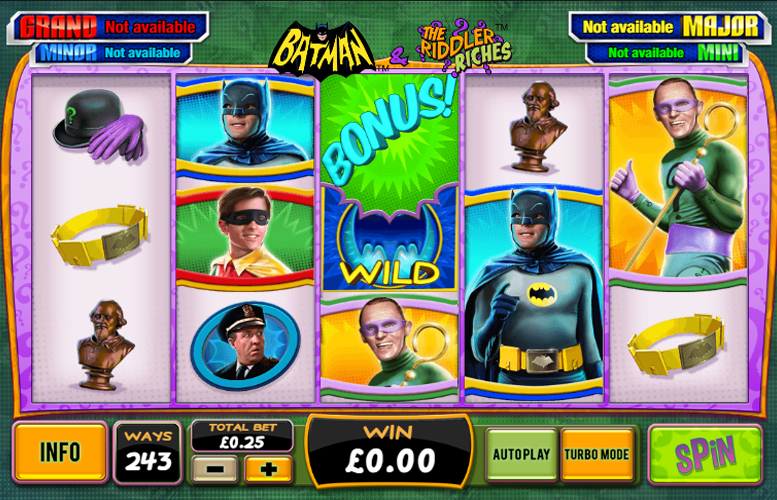 Batman and the Riddler Riches from Playtech is without doubt the best of the company’s original Batman slot machines. It has a plethora of great features, the DC progressive jackpot, and a classic look and feel that is complemented by an authentic soundtrack. It doesn’t matter if you’re not really into Adam West’s classic portrayal of Batman. There is enough to love about this machine either way. Let’s begin. Riddled with special features. This gives the game immense replay value. Great 1960s music. The game has an authentic feel already and the soundtrack complements it. Progressive jackpot. Players can win a life changing sum of money on this title. Somewhat low upper betting limit. Most players will be fine with a maximum bet of £60 but we needed to find a negative about this great title. Riddler= 500x the line bet. Batman = 300x the line bet. Any single win will trigger a collapse. During this, any symbols forming part of a winning combination will disappear after being paid out. This will trigger wave two. 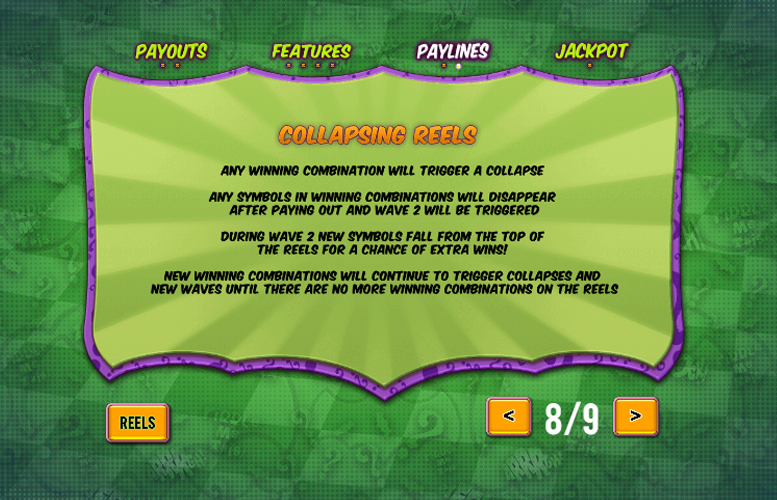 During wave two, new symbols will fall from the top of the reels for a chance to win again. This dynamic will continue until no new wins are possible. The Mystery Spins feature can be triggered at random on any main game spin. During the main game, the Riddler may add mystery symbols to the reels. These all transform into the same symbol and can create some massive wins. If the wheel stops on the Sticky “Wild” Free Games, sticky “wild” symbols are added to the reels for duration of the bonus. These can land on any spin and will stick on the reels up to wave three. During this feature, all wave two, three, and four wins are multiplied by 2x, 3x, and 5x respectively. When all waves have resolved, the multiplier returns to 1x for the next spin. Players will be presented with 12 boxes. They must select boxes to open them. These will reveal cash prize values. If the player can match three cash values, they’ll win that prize. Following the prize phase of the bonus, they must open an additional three boxes. These will reveal a multiplier amount to boost the win. 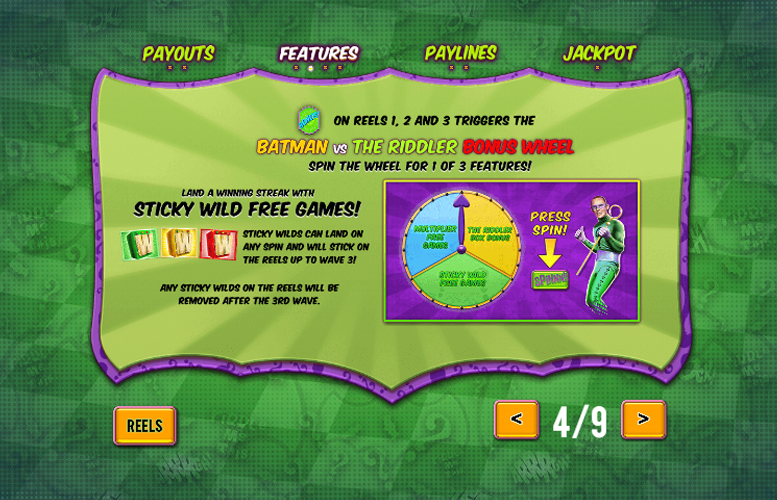 Rather than use traditional win lines, the Batman and the Riddler Riches machine instead operates a “ways to win” payment structure. Players must match symbols anywhere on consecutive reels from left to right. 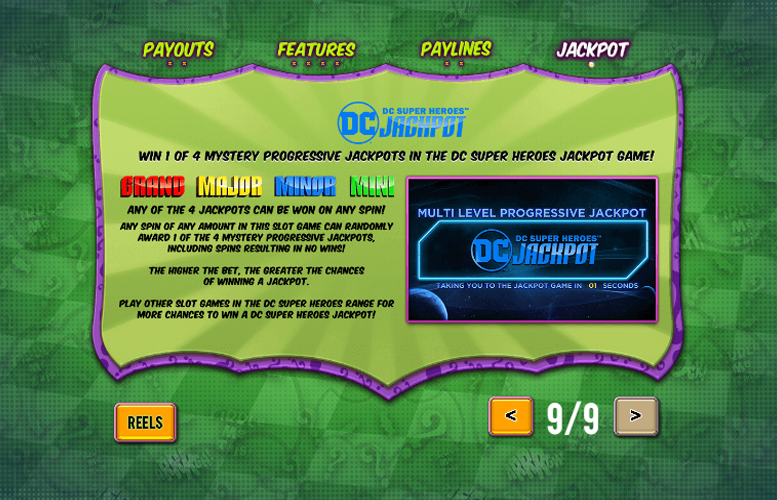 The Batman and the Riddler Riches slot machine also has a progressive jackpot. This can be triggered at any point during the main game. It happens completely at random, although players should note that increasing the size of the bet will make it more likely to occur. 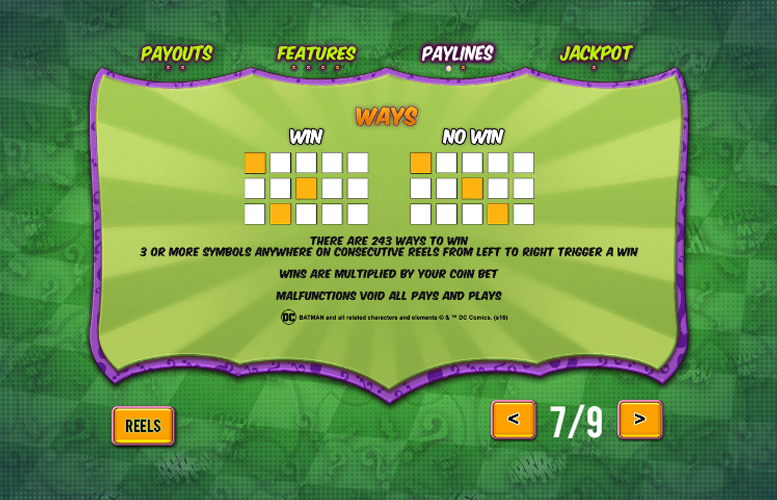 To play the progressive jackpot mode, players must select from 20 different icons. Each one hides a different coloured symbol that corresponds with one of the four jackpots on offer. Players collect these symbols and the first jackpot to fill up will be awarded. The best part is that a jackpot must be awarded every time the progressive mode is triggered. Policeman = 50x the line bet. Riddler’s hat and gloves = 20x the line bet. Batbelt or Bust = 20x the line bet. 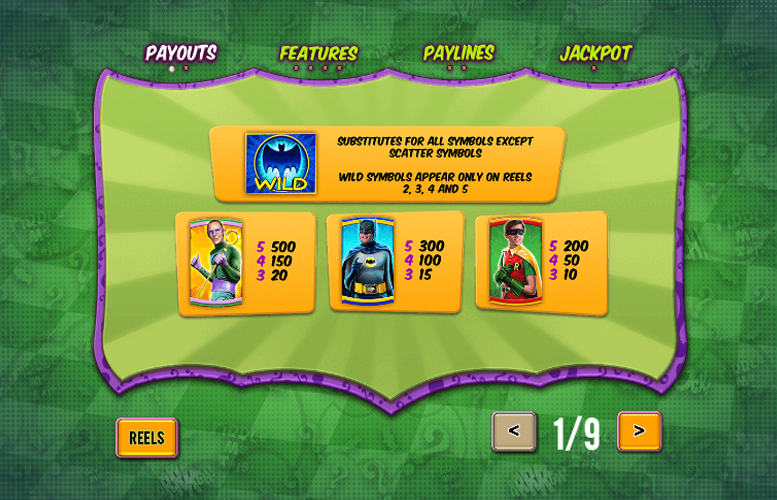 Being as it doesn’t use typical win lines, there is no option to vary them on Batman and the Riddler Riches. The only option players are given to adjust their bets is to change the total bet amount. However, for the purposes of betting limits, the game plays as if there were 25 win lines. The minimum total bet is just 25p. This is the equivalent of paying 1p per spin on each win line. Meanwhile, the maximum total bet is £60. This equates to betting a rather curious £2.40 per spin. Whilst a £60 upper betting limit will satisfy most players, the highest rollers might be discouraged from playing this title. This game has a rating of 7 / 5 with 685 total reviews by the users.